Porridge sachets. Making oats more awesome. British jumbo oats. Speedy sachets. No added sugar - contains naturally occurring sugar. Gluten free. High in protein and fibre. Vegetarian Society approved.Awesome Oats We use only wholegrain oats in our Porridge, which means they contain all 3 parts of the grain, keeping all of their natural goodness. They are high in fibre, in particular soluble fibre, which makes them perfect for the digestive system. The soluble fibre is called Beta Glucan which has been shown to maintain normal blood cholesterol levels. Each serving provides 1.9g of beta-glucan from oats, which is 63% of the recommended daily allowance of 3g. All of our oats are naturally gluten free. 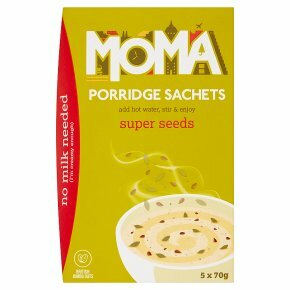 At MOMA we source our oats from only pure uncontaminated British crops so that everyone can enjoy our porridge.